Leaves narrow-linear, mostly 2–6, rarely to 8 cm long, 3 mm wide, pungent-pointed. Male cones cylindrical, 5 mm long, in clusters. 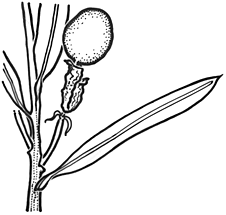 Female cones usually solitary in the leaf axils; scales few, fleshy, combining with the stalk to form a receptacle. Fruiting receptacle blue-black, glaucous, fleshy, bearing 1 or rarely 2 almost globose seeds, 8–12 mm diam. Distribution and occurrence: in sheltered coastal sites and gullies on the adjacent ranges; chiefly on the coast south from Woy Woy and valleys of the Blue Mtns.